Everyone needs a candied orange peel recipe. Candied orange peel is a great recipe to have under your belt; really easy, makes the house smell lovely and can be used in dozens of ways.. and you’re not confined to just oranges.. I woke up one morning with the sudden desire to make candied orange peel recipe. Who am I kidding… I was looking for a garnish for a delicious orange cake that I was making and candied orange peel was the way forward. It’s a perfect combination of sharp citrus, sweet sugar glaze, a little crunch or little chew..and it makes the house smell nice when you cook them. There isn’t too much to say on the matter; you can use oranges, limes, lemons a mixture of all them. A couple of points to note; use an unwaxed variety. And when peeling your citrus fruit use a potato peeler, you get really nice thin pieces of peel without any the pith. You can make these quite chunky to snack on but I prefer to have them really thin and crunchy and quite often dice them up to scatter over a dessert, I’m just that sort of guy. When did I stop being cool? Was I ever cool? Oh maaannn…. 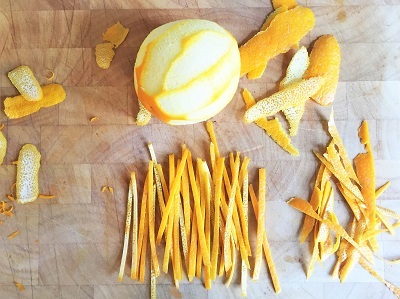 Anyway, here’s my recipe for candied orange peel and if you pop them into a jar or zip lock bag they last for ages (at least a few weeks)..
Add your peel to a saucepan with two cups of water, pinch of salt and bring to a boil and then let simmer for 20 minutes. Turn off the heat and remove the peel from the pan. Measure out 1 cup of the orange cooking liquid and put it back into the saucepan (discarding any excess cooking juice) and add the 2 cups of sugar to the liquid and stir to dissolve. Once the sugar is dissolved; add the cooked orange peel to the pan and simmer on high for 10 minutes. Don’t stir the pan at this stage as the sugar may start to crystalise. Feel free to swirl though. Turn off heat, wait for the mixture to stop bubbling and then remove the peel (I use a fork) and place on tray lined with greaseproof paper. Note – you want to keep the peel separate and not touching as once it cools any that are touching will be fused together! Pop the baking tray into an oven at 70c for 2 hours to dry out. Once dried, remove from the oven and dust with caster sugar and ideally leave to dry out even further overnight.